Bath & Shower doors and enclosures - Gaskell Windows. Alumax Bath Enclosures and Shower Doors - styles and designs to enhance your bathroom. Features & finishes to fit your style. Easy daily cleaning with clean water and soft cloth. Every 45 days it is recommended to use ShowerBright Maintenance Kit. Available in Sliding, Pivot & Hinge, Design Line, and Stik Stall models. 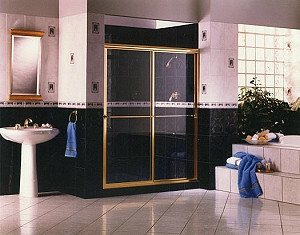 Shower doors include bypass, framed, frameless, and heavy glass units. Many finishes and glass patterns to choose from. Browse the Alumax Photo Gallery for inspiration of style, design, and features.